I’ve been wanting to post this project for a year. 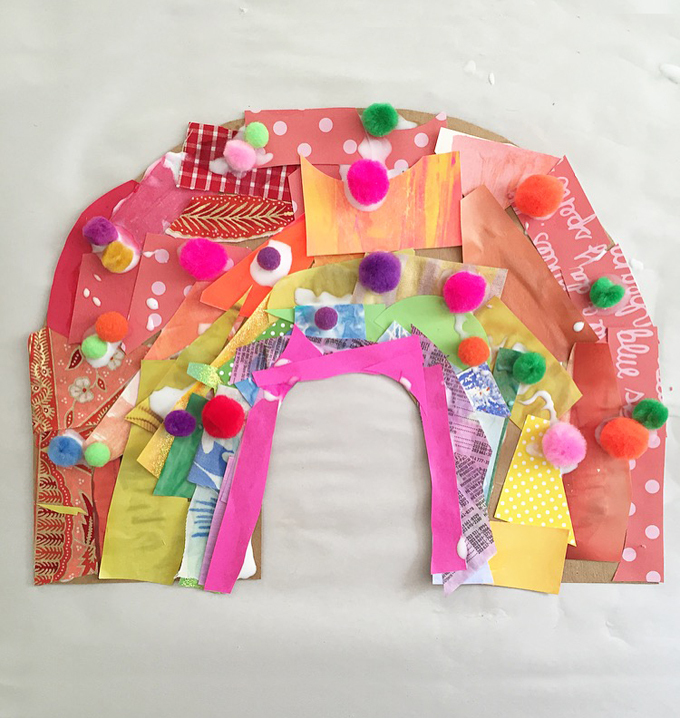 This rainbow collage invitation was presented to my art camp kids one year ago today, which just happened to be the same day as the Pulse night club shooting in Orlando. My little kids obviously didn’t know anything about this, their happy faces a stark reminder that there is so much good in this world. 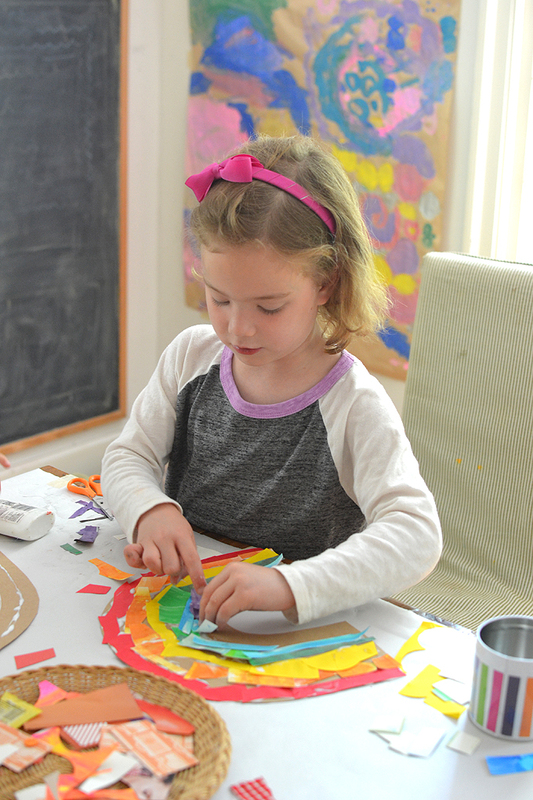 I had a hard time keeping my eyes dry that day, but for the five and six-year olds, it was just a happy rainbow-making time. And now, on the one year anniversary of this sad day, here I am finally sharing these photos with you. I am a terrible planner, and I honestly forgot today was the anniversary until I listened to the radio on my way back from school drop-off. I had to change my intro to reflect my heavy heart today. I continue to focus on the good and decent people around me in my life, as I honor those whose dreams were cut short too soon. 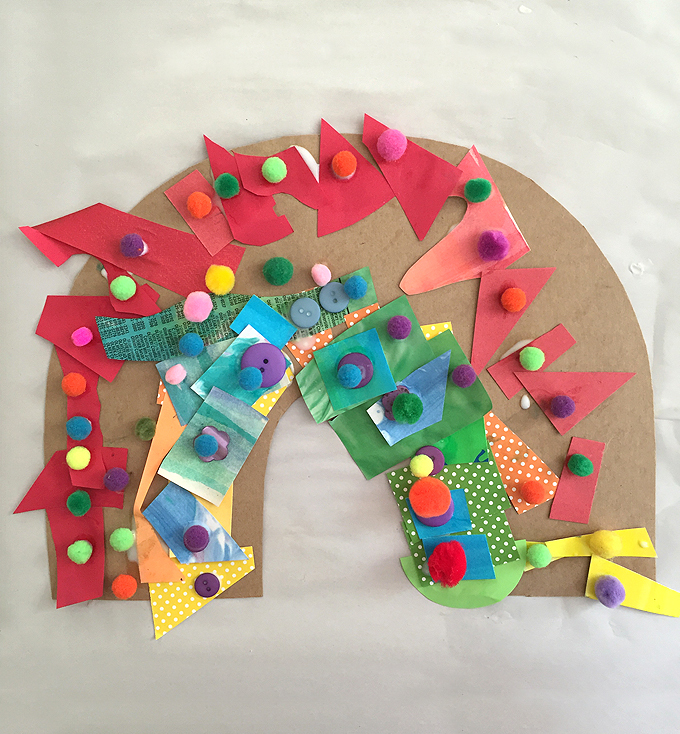 The idea for these rainbows came from one of my favorite art studios, Collage Collage in Vancouver, BC. Owner Erin Boniferro not only has the most wonderful art ideas, she also runs a beautifully curated shop within her studio. A visit to Vancouver is on my bucket list! 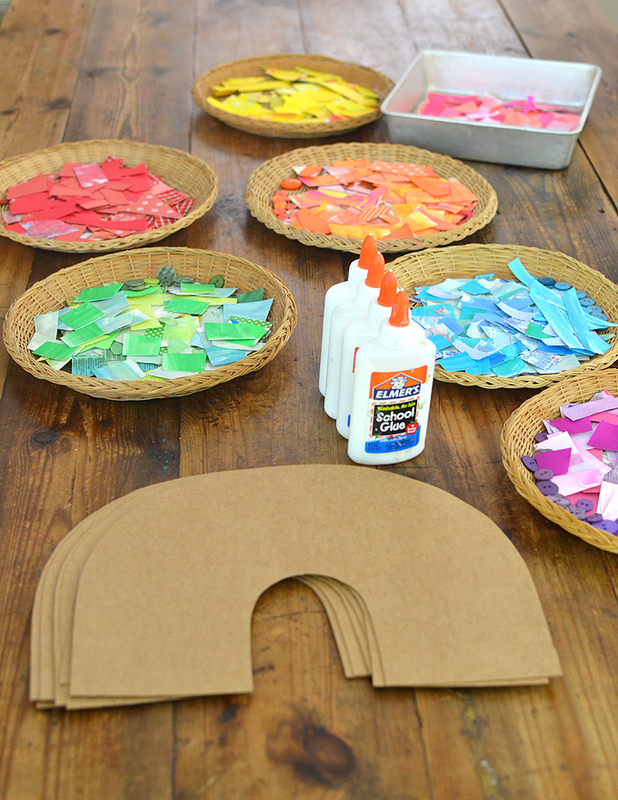 ~ First, make a rainbow template. 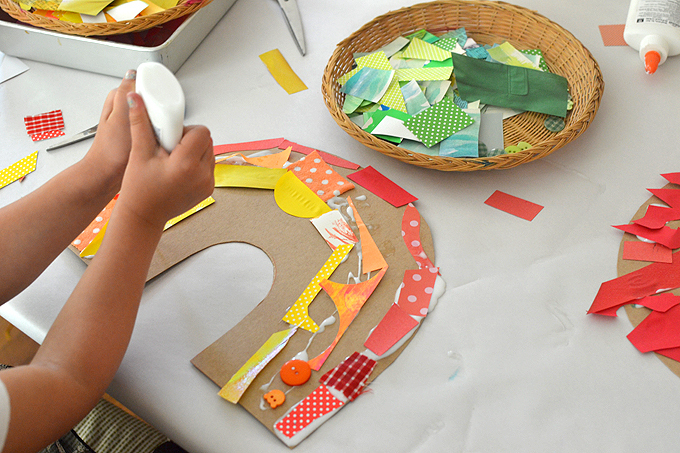 Cut out one rainbow shape from regular paper, and use that to trace on top of the cardboard. ~ Next, prepare your collage materials. I collect lots of scraps throughout the year so may of these odd shapes were already cut. I then went through my old art drawer and took out a bunch of paintings. 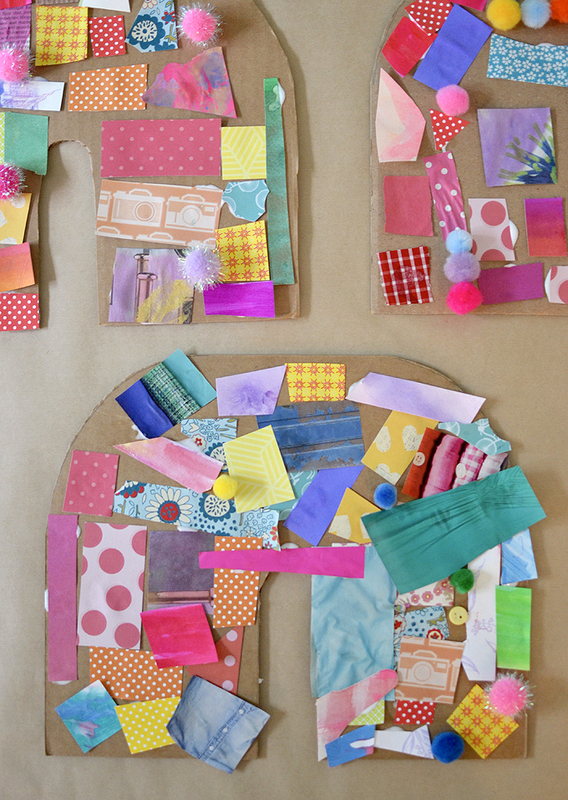 I cut these into square and rectangle shapes. I also have a draw of colored paper and a drawer of patterned scrapbook paper. 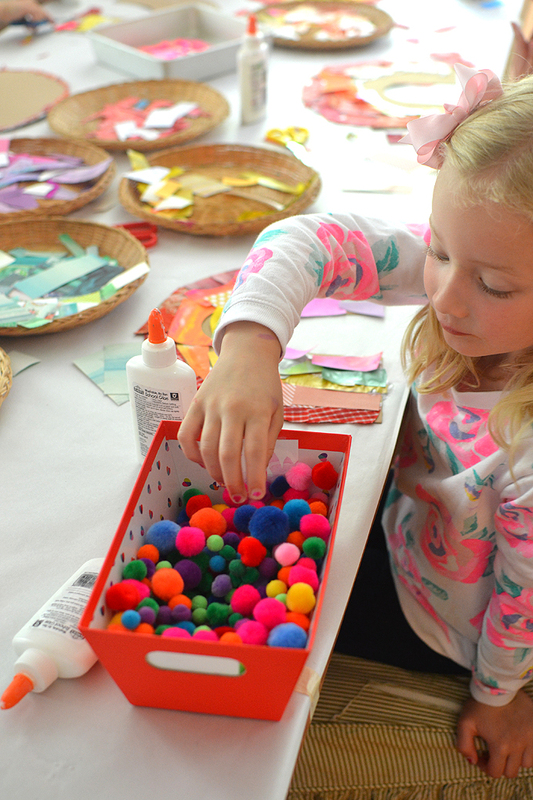 (I use the Alex drawers from IKEA to store paper and old art.) I selected a few pieces and cut them up. Next I found some fabric scraps and cut those up, too. 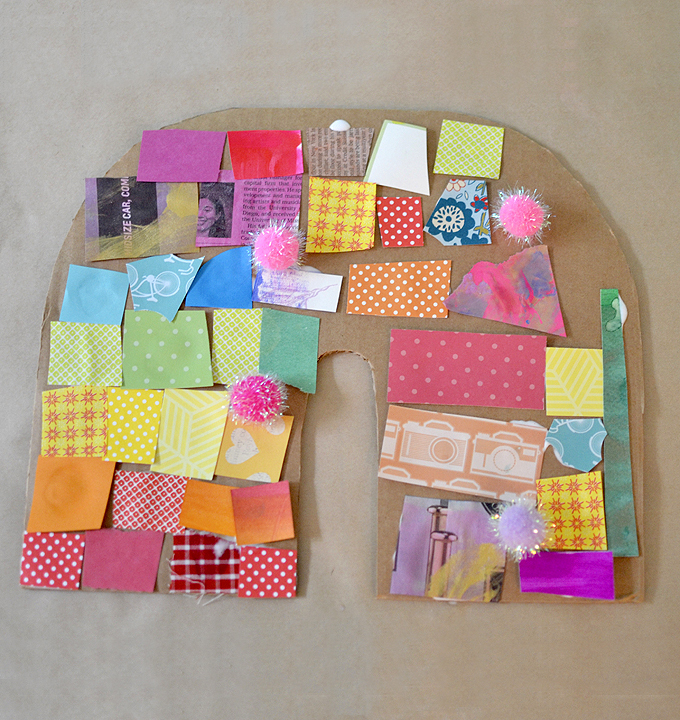 Lastly, I separated each color into its own tray and added some buttons. ~ If you have pom-poms, put some in a basket. 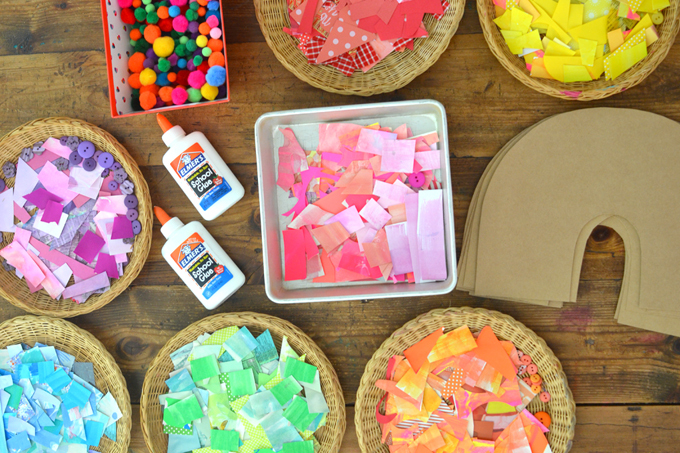 ~ To set up your table, just put one rainbow at each place along with one glue, and spread the collage material along the table. The children will have to get up and walk around to find the color they need. 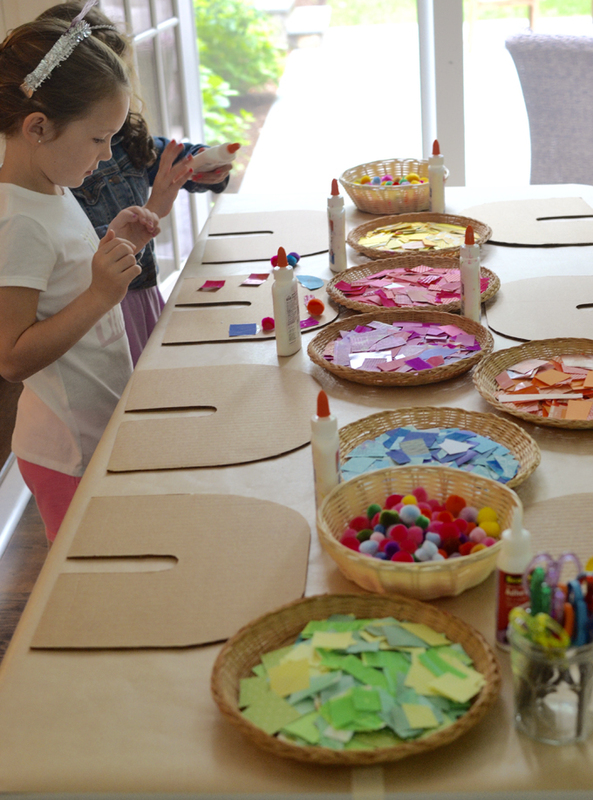 For smaller children who may just use what’s in front of them, I gather a little of each color and put it next to their rainbow. ~ Then, just let the children do their thing. You can just stand back and enjoy watching their process and listening to their chatter. ~ When the rainbows have dried, you can punch two holes at the top and add a wire if you want to hang it up on a nail. This is optional. 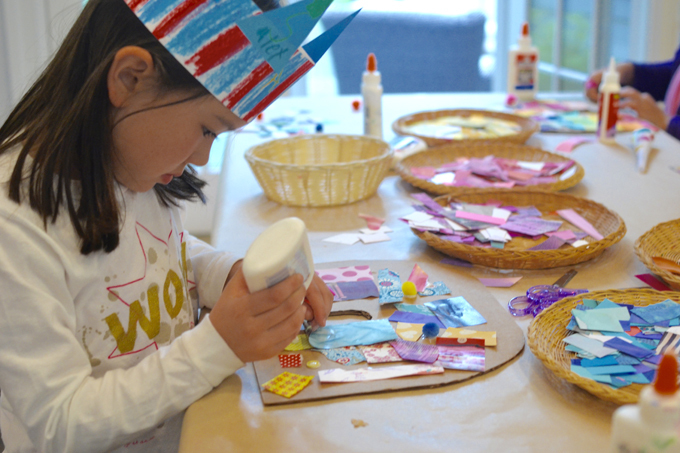 Last weekend I did a birthday party for 6-year old Riley and she chose to make these rainbow collages. 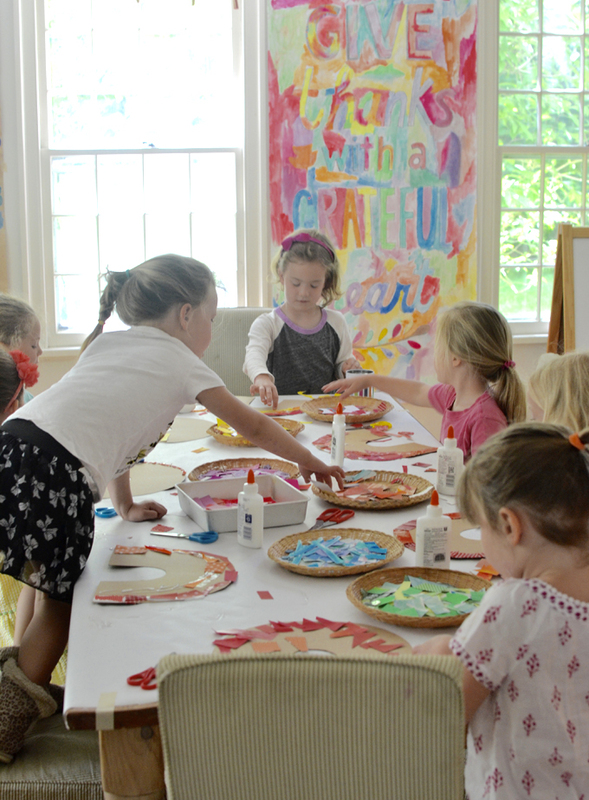 What I love about this idea for a birthday party is that it’s sort of a craft, but also very open-ended so that each child makes something different. Since there are no instructions to follow, it’s stress-free! No right or wrong. Here are some photos from the party. This time I used thicker cardboard. 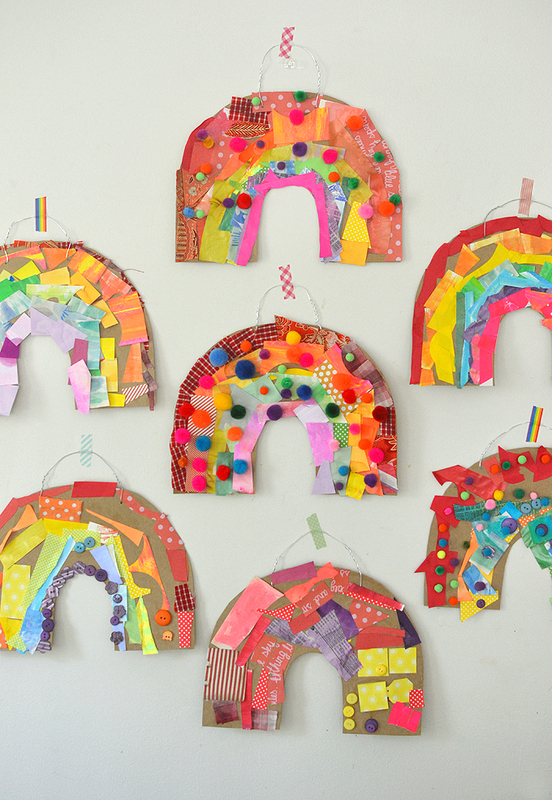 I love looking at these rainbow collages. I wish I could keep all of them and hang them on my wall permanently. A rainbow wall of love and acceptance. 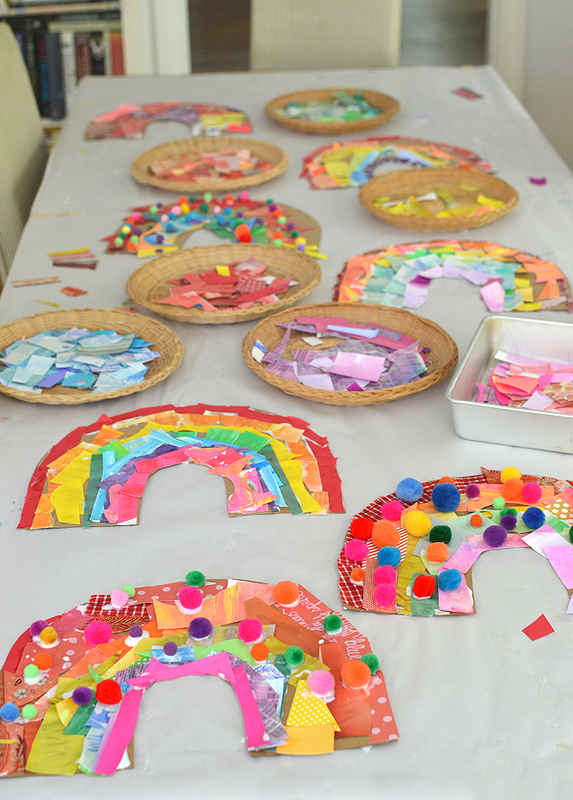 Roughly what size did you make the rainbows? They’re the perfect size for really letting the kids have some space and go free. I adore this project. It’s just so happy. I just ordered your book from Amazon and I am SO EXCITED! The book is fabulous! So inspiring. This got me all teary. Thanks for spreading some love and sunshine.